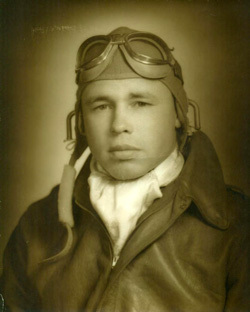 The WWII remains of Herbert W. Harms are returning to his hometown of Rutland. Harms has been listed as killed in action since 1944. Herb served as a B-17 tail gunner assigned with the 569th Bombardment Squadron, 390th Bombardment Group, 13th Combat Bombardment Wing, 3rd Air Division, 8th Air Force. On Aug. 16, 1944, his aircraft was struck by anti-aircraft artillery during an oil refinery bombing mission to Zeitz, Germany. The bomber, named the Dottie III - Green Banana crashed just outside the village of Cauerwitz, Germany. Eight of the nine crew members safely bailed out and were captured and held as POWs. Harms did not survive the crash. Herbert Wayne Harms was born in Rutland on Oct. 4, 1915 to Harm G. and Edna Harms. Herb had six brothers (Warren, Elmer, Willard, Albert, Ralph, and Walter) and five sisters (Leora, Louise, Myra, Wilma, and Wahneta). Being the third oldest boy, Herb was known as the adventurer. After graduating (Salutatorian) from Rutland High School in 1933, he completed a two-year teacher's course at Illinois State University. Not finding a teaching position is where the adventures began. Herb hitch-hiked to Texas for work and eventually spent time in California. He's best known for his adventures in Alaska, hunting and working a gold claim. The fox furs he gave to his mother still remain in the family. Herbert is survived by his sister, Wahneta Hacker (Carl) and many generations of nieces and nephews. Growing up, all of the cousins heard about a promise made to Grandma Edna by each of her children ... "When Herb is found, please bring him home, to be buried in the family plot." Well Grandpa and Grandma Harms, the promise has been kept, your boy is home. A special thanks from the Harms family also goes to Mr. Chris Unitt (England), for his diligent and continued research helping to make it possible to get â€˜Uncle Herb' positively identified. Visitation will be from 11 a.m. to 12 p.m., Saturday at the Ruestman-Harris Funeral Home in Minonk. A military graveside service will follow immediately after at the Rutland Cemetery.